Those who like to wear foundation and powder on a daily basis will understand how difficult it can be to keep make-up looking fresh all day long. Many women are so grateful to find a shade of foundation that suits, that they often choose the wrong kind of formulation for their skin. 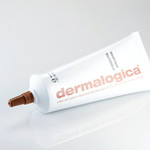 This is one of the key causes in make-up sliding off or looking greasy by mid morning. Even those who only wear the slightest touch of foundation can find it difficult to keep it looking picture-perfect, and constantly find themselves making retouches throughout the day. Not only can this be annoying, it can also be very time-consuming, especially for those who are rushed off their feet all day long. Nowadays, there seems to be constant new additions to the foundation market, promising new and exciting results. However, if the product isn’t suitable for your skin, it’s highly unlikely to work any major miracles for you. Thankfully, Dermalogica have a line of foundations that is constantly being championed by top celebs all over the world- and it’s no surprise really! Dermalogica Treatment Foundations are oil-free products, which also boast fab moisturising properties- which makes them great for most skin types. As it is oil free, it won’t interact with your moisturiser and turn your face into something resembling an oil slick by lunch- making it the perfect product for a flawless complexion.